Ask your doctor, local pharmacy or medical supply for an AquaShield or order one directly from us. Refer to the Product Information Section to determine the correct model number for your circumstances. Call 1-800-338-8512, Monday through Friday between 8 AM and 3:30 PM Pacific Time to speak with our sales staff and place an order to be sent via Priority Mail that day. Our price, which includes the applicable sales tax and Priority Mail postage, is $31.50 for Arm models and $32.50 for Leg, Knee and PICCGard models. Orders received by 3:30 PM Pacific Time are typically mailed the same day and take 1-3 days to arrive in your mail box. During the evening or on weekends, complete the information request form below, include a daytime phone number, and we will call you on the next business day for a credit card number and to help you determine the best AquaShield for your circumstances. We offer six of our most popular models on Amazon. But if you have any concerns about sizing (i.e. xtra-large or thin limbs) calling us is best with a tape measure and the patient nearby. Or you may visit our partner website – CASTCoverZ! 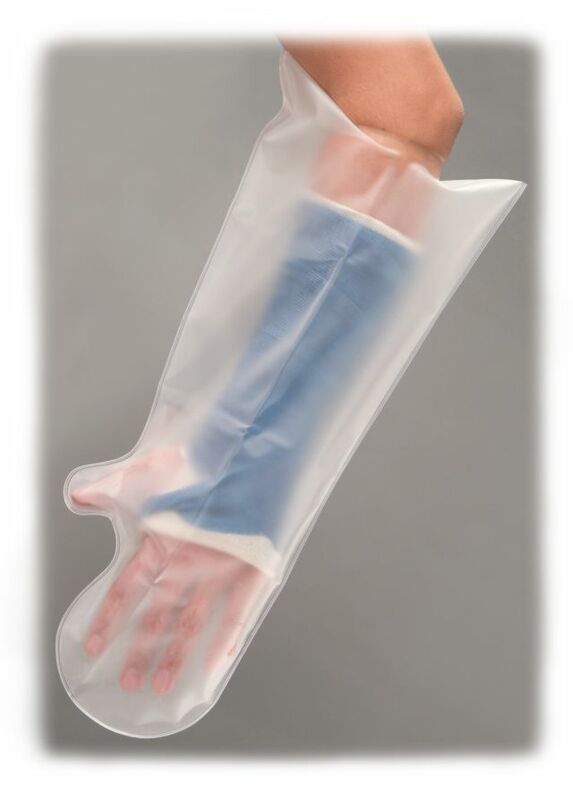 – to combine orders for fun & fashionable fabric covers as well as your AquaShield.